This is a continuation of a series of posts on the Nikon D850. You should be able to find all the posts about that camera in the Category List on the right sidebar, below the Articles widget. There’s a drop-down menu there that you can use to get to all the posts in this series. You can also click on the “D850” link in the “You are here” line at the top of this post. Because this relates to the a7RII, this is also a continuation of a series of posts on that camera. You should be able to find all the posts about that camera in the Category List on the right sidebar. This is called “white balance prescaling”, and is used on many Nikon cameras, including the D850. Here are PTC’s for the two green channels, at ISO 64, using EFCS, 14-bit precision, and lossless compression. The data points are different for the two green raw channels, but the curves are virtually the same and look just like you’d expect a PTC from a well-behaved camera to be. Look familiar? Pretty much like the a7RIII curves. 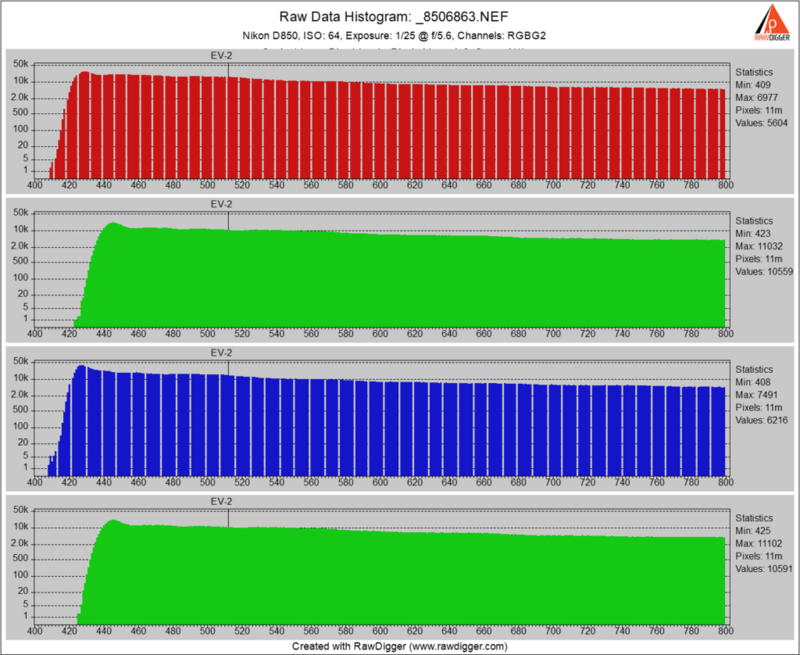 By the way, the full well capacity (FWC) of the D850 falls out of this test, and turns out to be about 62000 electrons if you look at the green channels, and 51000 and 54000 electrons respectively if you look at the red and blue channels. 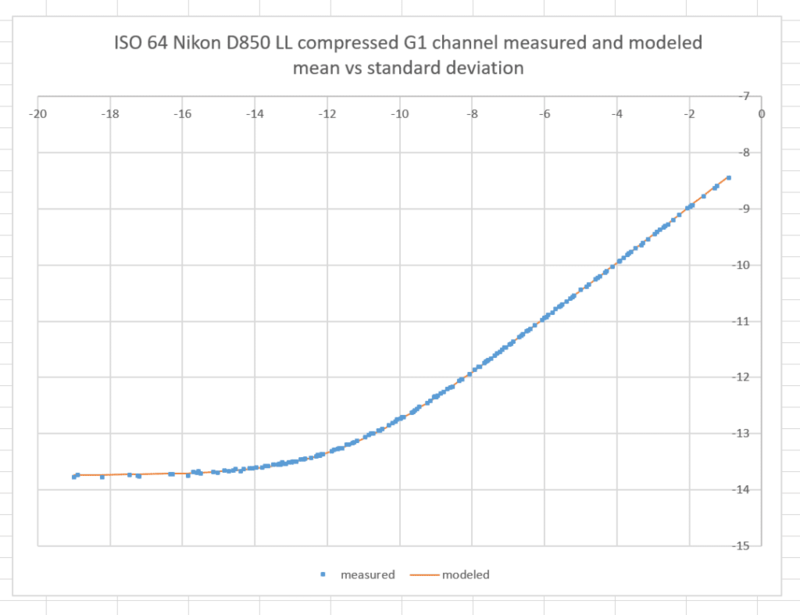 That means that the FWCs that I computed for the a7RIII are probably low. A good set of results. It’s pretty much what I would expect to see given the histogram gaps in the red and blue channels. There’s an important corollary of all this. The ripples created in the photon transfer curve represent non-linearities which can give rise to colour casts in shadow area. 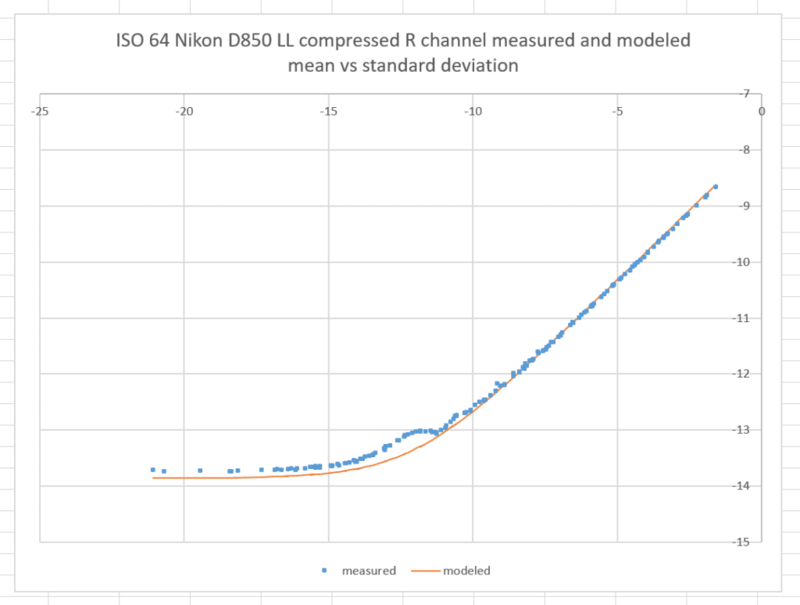 It’s more likely to affect the Sony A7RIII than the Nikon D850 because the ripples travel further up the PTC curve on the A7RIII. It was even worse on the Mark1 models of the Sony A7 series because a multiplier much closer to 1.0 was used. You are most likely to see the effect in boosted shadow areas at ISO 100. With a strongly vignetting lens it can appear as a slight concentric banding, especially in large underexposed areas of sky or fog. The effect is most obvious for astrophotography where flat frames are taken and division used to remove vignetting . How old is that curve? The a7R, D800, a7RII, and D810 would be outliers, too. 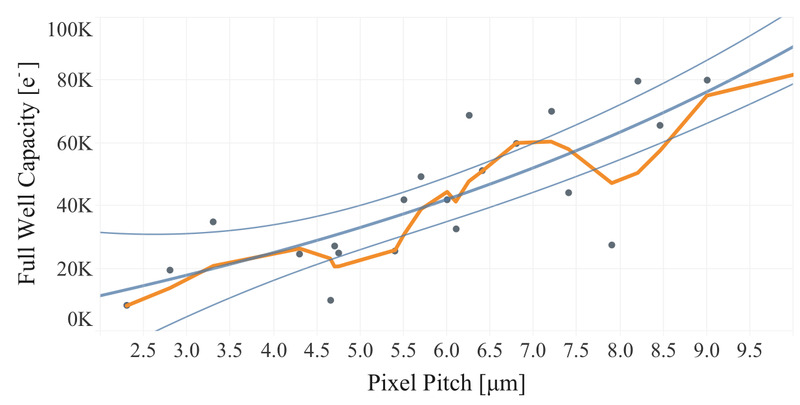 The original purpose of that plot was to show that there is a x^2 proportionality between FWC and pixel pitch (or, in other words, a linear relation between the area reserved for each pixel and the FWC). If you limit to any particular point in time, say +- 3 years, it is much less noisy/fuzzy. There are gains made over time, as one would expect. It seems the DR-pix Aptina/Sony designs are way ahead of the curve in FWC at low ISO, and superb in read noise at high ISO. Dark current is kind of poor, though. Well, that’s badly worded. The FWC is of course constant with ISO, but the gain clips some portion of it at ISOs higher than base/unity gain. 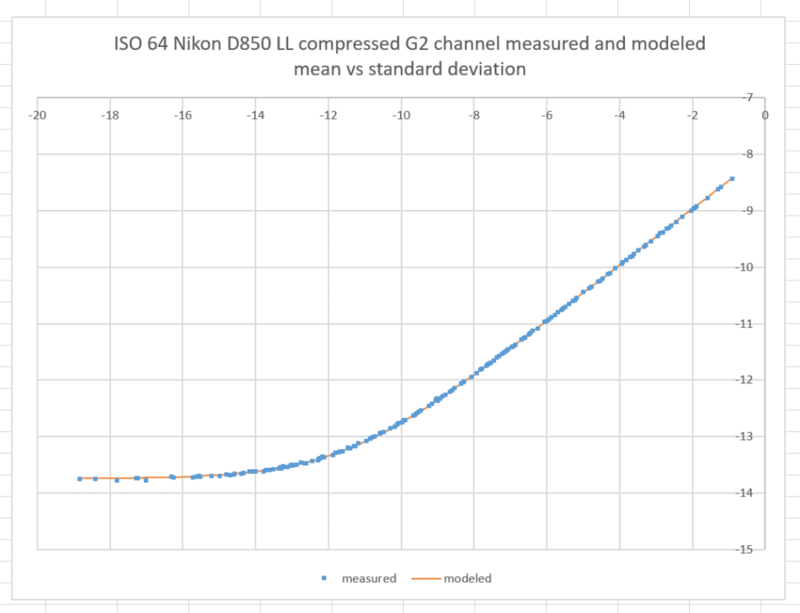 Yeah, the metric that is normally cited for saturation is e-/micron^2 – the D850 would come out at about 3285 in the green channels, which is in line with the D810. 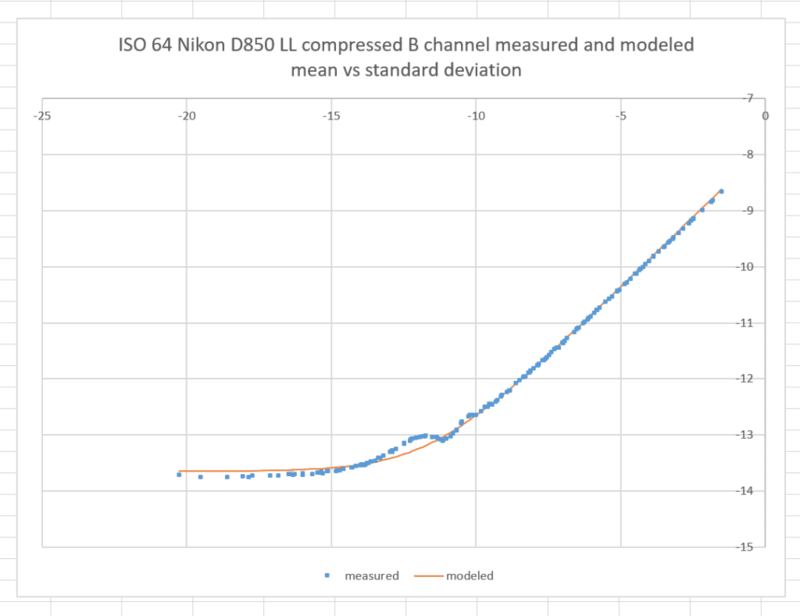 Incidentally, saturation is pretty well the same for all channels at a given ISO. The measured differences are due to the relatively different gains in the R and B channels: a higher gain causes earlier clipping. Yes indeed, sub bit quantization. We had the same issue with virtually every recent Nikon (D810, D750, D610, etc.) and Sony (A7, etc.). Sub bit quantization? I agree it’s a form of quantization error – caused by the scaling of the digital values. But this error isn’t occurring down at the LSB – it propagates a long way up the PTC. And, with my present methods, it causes the FWC to be modeled erroneously. I’m not sure what to do about this. Even when the model fits the data at the high end perfectly, the D850 red and blue channels show different FWCs than the green channels. That’s clearly wrong; the CFA doesn’t change the FWC. The digital scaling destroys the relationship of the mean and the sigma in the photon noise. I don’t think the gaps are the problem for computing FWC; I think it’s the gain itself. I can compute and correct for the gain, and see it that makes the modeled FWCs nearly the same. I think I’ll do that. Re: FWC of ringing PTC. You can see the model is bending the slope near clipping to accommodate some ringing in the shadows, therefore getting an incorrect FWC. But we do not need the deep shadows to estimate FWC with pair subtraction: simply take a few dozen points around, say 1-10% of full scale, calculate SNR and square it to get the signal in e- there. Then scale it to 100%. With Nikons that I have checked in the past FWC of R and B has been FWC of G divided by the gain implied by the gaps in the histogram. When I tell the modeler to ignore midtones and shadows when calculating the FWC, it’s still different — and, I believe, wrong — for the red and blue channels. The digital gain invalidates the full-scale assumption underlying the FWC modeling. Your last sentence is, I believe, bang on. Yeah, that’s the reason to go through SNR: gain cancels out.